Velimir Voronin was born in Mongolia to tribe of Luperci that called themselves Eagle Tribe. He was raised to be a bodyguard to the group’s leader, and became an exceptionally skilled fighter as a result to his duty and the region’s naturally chaotic atmosphere. A conflict-gone-wrong drove him to flee his homeland with his assigned ward in tow. They fled west, chased by their enemies, and eventually bartered their way onto a boat heading to the New World. When Velimir’s ward died in-route, however, he was left in a foreign land alone, and without a purpose in life. He eventually made his way to Portland, where he met Heine Kaiser. After months of interaction, the father and Velimir eventually came to an arrangement where Velimir would look after Heine’s daughter, Kamari Kaiser, and act as both her teacher and as a protector where Heine could no longer serve. He is currently a member of Salsola, ranked as one of the Family. 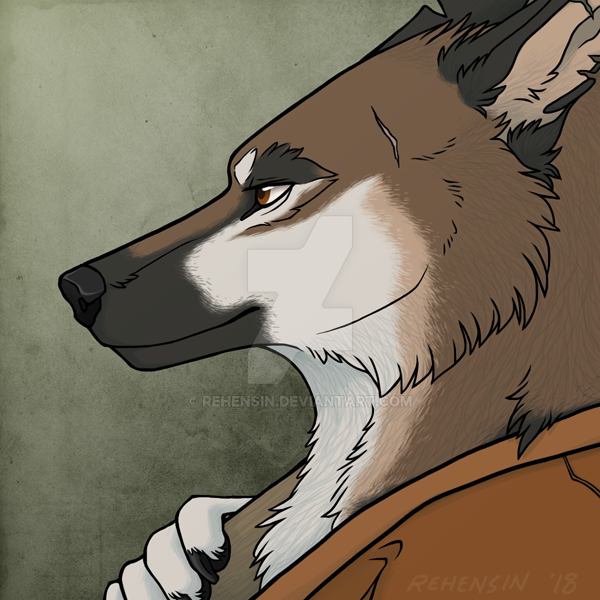 Outside of the pack, he assumes the name “Khenbish,” meaning, literally, “nobody,” which he finds to be very clever and amusing. When accompanied by Kamari, he typically disguises his scent to match her own to keep the ruse that they are related. Alone, he usually adopts rather neutral scents that help him be easily forgotten or not stand out. Build and Size: While not entirely small, Velimir is a very lean individual, built with muscle from years’ worth of discipline and practice. It is unlikely that he will ever grow overly fat. Optime: Nimble, limber, and quick, what Velimir lacks in brute strength or intimidating size, he makes up for in agility. He has a built upper torso and strong legs from his discipline as a martial arts-type fighter and from horseback riding. This is lean muscle, however, allowing Velimir to not look like a body builder of any sort. Humanization: Highly humanized, though he generally wears loose clothing or animal furs during the colder seasons. It is also not uncommon to see him forgo clothing at all. He is very talented and does many things in his daily life with his hands, so, he is rarely seen out of his Optime form unless he is hunting or tracking/scouting. Older in his years, Velimir has learned to be more accepting of his fate in life. He has taken to his quest for inner peace quite seriously, and often tries to view things with a neutral point of view, taking in all of the facts, nuances, and observations before he acts. He rarely raises his voice or his temper, and it appears that he is slow to anger or get riled up. Or, at least, it’s slow to build him up to a point where he shows it. Being met with a stern look or reply is often a sign that he has taken something quite seriously though. Often times, he appears relaxed and unassuming. A fire still burns within this old man though, and Velimir is not above putting someone in their place or defending something he cares for or believes strongly in. He can be stubborn, but he can also be understanding and lenient on certain things. He takes his duties seriously, and his loyalty is one that any wise Luperci would not soon throw away. He enjoys teaching younger generations, and is an often a good instructor because of his patience. Velimir may occasionally tease or test those younger than him if a lesson is to be learned (or simply for a harmless laugh). He tends to joke about his old age, and may sometimes pretend to not understand something and revert to his native tongue simply to mess with someone. Strictly asexual, and uninterested in romance. He can appreciate an attractive individual, but does not experience any feelings for another in such a way. He believes such emotions and earthly desires would distract him from his role and mission, and has since led a life of abstinence. His only sexual encounter was part of a coming of age process so that he would know of the feeling, and would still be above temptation of partaking in the act once more. He looks upon polygamous and multiple one-night stands with disdain, believing those that do so are too enraptured by greed and their sensual desires, and are too rash and chaotic in their decision making. While he does not believe in any one true god, Velimir does believe in everything being connected in the universe by a force of energy. He loosely believes in reincarnation, but, his spirituality is found most prominent in his spirit of self, and maintaining and finding inner peace. He may be found meditating, or may be found performing slow-motion, flowy, dance-like movements as he twists the “energy” around him. Does not participate in drugs or alcohol due to his training and constant vigilance as a bodyguard. He could not afford to become inebriated, and old habits die hard. He has no desire to experiment either. Previously fluent in Russian, Kazakh, and Mongolian, but these have begun to diminish from lack of constant use. Quirks, Gestures, Etc. : Bows when showing respect; a bow from the hip would be more respectful than a slight lean forward while dipping one’s head. May often appear to stare off into space. General Posture and Body Language: Relaxed, but there is an undertone of pride and confidence, and a hint of rigidness to his muscles as if waiting to be attacked. 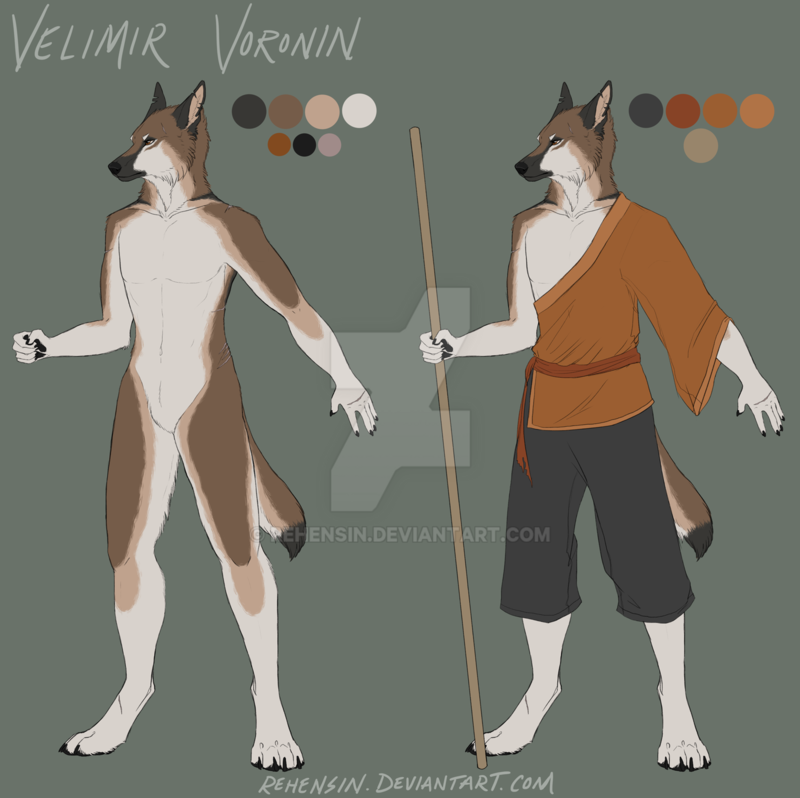 Education and Learning: Trained from a very young age in preparation of a roll he would eventually fulfill within his tribe, Velimir has been familiar with the art of combat for his entire life. His tribe’s constant conflicts and his strict discipline upon its destruction had kept his skills sharp. He practices daily. Close Combat (Master): Velimir’s primary style of fighting, it is heavily acrobatic and martial-art-like, focusing the most on using the opponent’s own momentum and body against them. It contains a lot of evasive maneuvers, quick strikes, convenient positioning, and grappling. He was taught a lot of his techniques from the tribe, and incorporated others from his mother’s family. Bo Staff (Journeyman-Master): In his youth, Velimir did not think highly of the Bo staff. Upon going on the run from Tiger Tribe though, Velimir took up the staff as a connection to his old home and monk teachings from his mother’s side. It has since become his primary weapon in a world where conflict is not constant, but it's always safe to have an unassuming weapon just in case. He often uses it under the guise of it being a walking stick. Knives (Master): For many years, Velimir used bone/antler knives in conjunction with his primary, hand-to-hand fighting style. He can wield the short blades with a natural ease, and while he has taken to using his staff more as his primary weapon nowadays, Velimir is rarely found without a knife on his person. Since coming west, he has started to use steel knives. Archery (Journeyman): While something that he has trained and used since he could shift, Velimir has never been a master in the talent. He shoots very well, and rarely misses his intended target, however, his precision is not as honed as someone with a natural affinity for the weapon style. He is very talented with mounted archery, which was his primary usage for the weapon. He is more experienced with a short bow than he is a longbow. Equestrian (Journeyman): Born into a tribe of horsemen, Velimir learned very early on in how to ride and work with horses. He understands a lot about them and how to tame and train them, however, even as knowledgeable as he is, he will still look to consult with another when met with a difficult horse or strange behavior. He is also less interested in breeding them than a more advanced horseman might be. Sleight of Hand (Journeyman): Something of a natural talent, Velimir is quite capable of nabbing things discreetly, be that through a distraction, taking advantage of the situation, or through deception and sleight of hand. He is no expert pickpocket though, and often understands and yields to the limitations surrounding his intended target. Small Craft (Whittling, Grass weaving) (Journeyman, Apprentice): Whittling was a hobby that was picked up after learning a bit from a fellow tribesman. He has an eye for detail, and finds comfort in carving little animal totems that the children of his tribe once enjoyed. He sticks strictly to small-scale, wooden sculptures and amulets, or adding little designs into larger, pre-made pieces. He has invested more in this hobby since arriving in North America. Grass weaving was something he took up to pass the time while on the plains of the steppe. He can make bowls and little woven trinket-like items. As it was done when he was bored and stuck out on the plains, he does not have any exceptional skill in this. He can make a mean basket though. Herbs (Apprentice-Journeyman): Passed down from his mother, Velimir knew how to make teas, and was eventually taught how to make rudimentary poisons and temporary antidotes from plants too. The latter was learned as an alternate way to deal with their enemies, as well as a way to be prepared if the same were to be used in the Khan. Velimir did not learn anything beyond these though (and is by no means an expert), as he was not interested in the medicine field. Since traveling west though, Velimir has had to relearn the plants of the New World, and now more comparable to a mere beginner in the field. Multilingual: Previously fluent in Russian, Kazakh, and Mongolian due to the region in which he hailed from, these other languages have slowly been diminishing due to lack of use and having anyone that knows or understands them. Still, Velimir seems to grasp languages with relative ease, and has been using bits and pieces of his native tongues with Kamari. Reading and Writing (Apprentice): Velimir can crudely read and write in Common Tongue (to a lesser degree) and Mongolian, though, the latter is diminishing due to lack of use and material. Upon meeting Kamari though, he has been able to maintain more of it due to using it with her as a secret language. Low Speech (Mongolian Corvid and Eagle) (Obsolete): In his homeland, Velimir learned to speak rough corvid and eagle Low Speech, languages that were commonly taught as the birds were used as messengers from the scouts. Since leaving Mongolia though, Velimir was disheartened to learn that the dialect he once knew was not one spoken by the western birds, or even those of the New World. Heine Kaiser is a friend to Velimir. The two bonded over the similar destruction of their home packs, memories of the Old World, and voyage to the new one. They met by chance when Heine originally got Kamari her horse, and the two’s relationship only grew after that. Velimir respects the father’s want to keep his daughter safe, as well as the rough life he has had thus far. 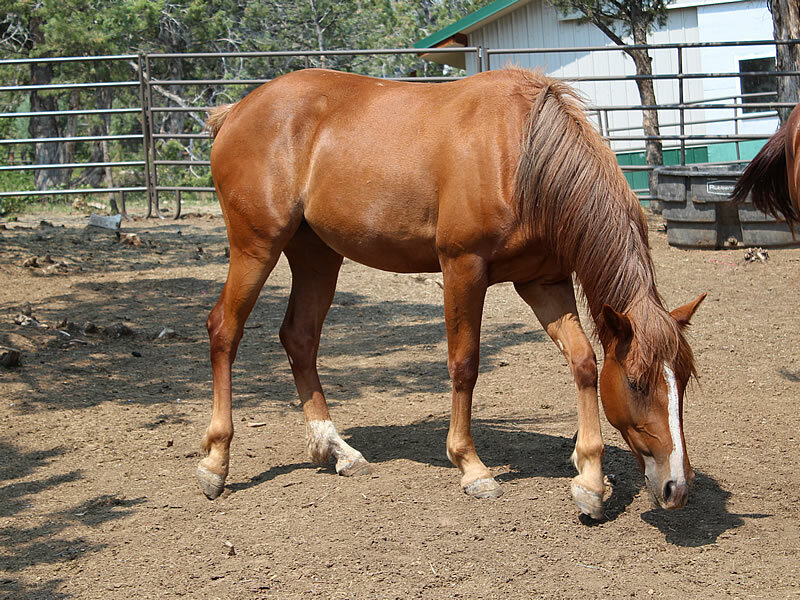 Sweet and easy-going, Sandstone is what many would simply describe as a, “good beginner horse.” She minds well, is docile, anything most Luperci would ask for. She can be playful at times, but can easily be brought back around with a stern voice or hand. Sandstone’s curious personality makes her ideal for introducing her to new things, however, it may sometimes be her downfall in certain situations. Sandstone was born wild, but was eventually caught and tamed with her mother from a young age. She grew up as a general riding horse, passing between a few owners as times changed. Eventually, she ended up in the hands of Velimir when he was passing through a town on his way to Portland. The two bonded and she has become something of a valuable companion to the old man. Velimir was born within a sizeable tribe of nomadic horsemen that, in the region of Mongolia, were known as the Eagle Tribe because of their quick and ruthless fighting style. The Tribe laid claim to an ever-fluctuating and ever-shifting size of land, as the area was often wrought with conflict as tribes warred with one another over ownership of valuable resource areas, particularly, the great, expansive plains of the steppe. The Eagle Tribe, as with many of the tribes, were led by a Khan, an individual of formidable fighting prowess, leadership skills, and military mind. His father’s family came from a long line of individuals loyal to the Khan of the Eagle Tribe, from a line that had pledged their sword since the tribe’s formation, and one that had protected the Khan for generation after generation thereafter. Velimir was trained from a young age in how to fight so that he would eventually protect the Khan as his father did. From his mother’s side, Velimir was raised with monk-like teachings as well as other seemingly menial talents. Velimir grew into a formidable ally to the Khan, and when the Khan bore a son, Bayar, Velimir was assigned to both teach and protect the growing boy. 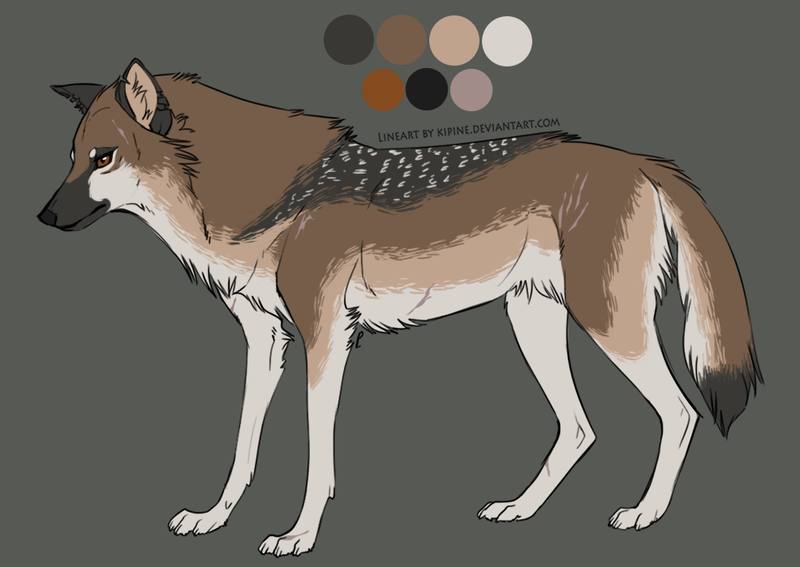 Things were never peaceful within the Eagle Tribe, however, there were times where it was quieter than most, and most of Bayar’s young life was during such a time for the Tribe. The region ever at war with their neighbors though, the calmer times did not last. Tiger Tribe, reborn and reformed under a new Khan and with strong, powerful, and large wolf fighters from beyond the northern mountains, descended upon the steppe. They viciously attacked the smaller tribes, and systematically destroyed any that were even tentative allies with Eagle Tribe. The Tiger Khan wanted retribution for her tribe’s previous defeat, and Eagle Tribe was her target. When Tiger Tribe descended upon Eagle Tribe, the Eagle Khan had confidence that they would defeat Tiger Tribe as they had in the past. He was wrong though, and when it became clear that Eagle Tribe would be decimated by this old foe, he ordered Velimir to take his son, Bayar, to safety. The pair fled to the western mountains, hunted down tirelessly by Tiger tribesmen ordered by their Khan to retrieve the Eagle Khan’s heir. Every time they thought they had outrun them, they’d be found again. The Tiger tribesmen were able to chase the pair far beyond their home in the steppe before they eventually abandoned their task. Hunted endlessly, Velimir and Bayar had become paranoid with their pursuers’ presence though, and their fear of capture or death drove them only further west. Eventually, they found their way into Europe, where they settled briefly before a scare drove them to take a ship to the New World. Bayar would never make it though. The Eagle Khan’s heir became deathly ill during the voyage, and eventually died, leaving Velimir to make landfall not only alone, but in a foreign land. Having nothing to return to in the world he had left behind, Velimir decided to pursue the monk-like lifestyle that had been introduced to him in his younger years. He eventually made his way to Portland, where he met Heine Kaiser. Being a man from Salsola, their initial meetings were done under Heine’s alias, Jaeger, and it was only after their trust and relationship grew over the spring and summer months of 2018 that Heine eventually reached out to him about the idea of Salsola. Initially, Velimir had little interest in joining a new group, content to live out his life quietly and become forgotten from the world. However, he felt a force pulling him in the direction of the Kaiser couple, a force he believed was the universe giving him a second chance to protect another. The couple’s daughter, Kamari, was alone back in Salsola proper, determined to bring honor to their family, even if it had meant sacrificing her own freedoms. Velimir was moved upon finding out the couple’s torn feelings between supporting their daughter, or trying to find the whereabouts of their runaway son. Promising to look after their daughter, Velimir made his way to Salsola proper.